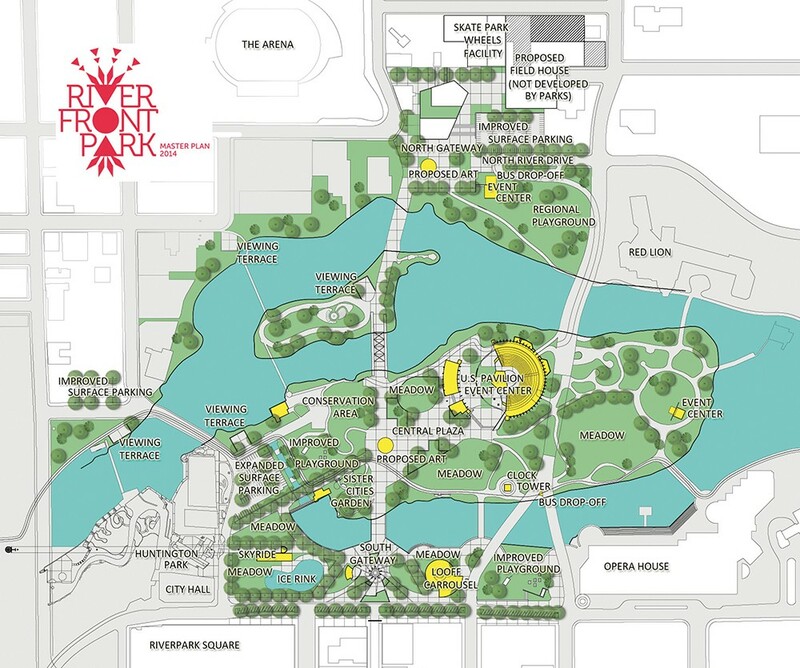 A map showing planned renovations to Riverfront Park. Supporters of this year's park bond and streets levy have been campaigning largely on dollars and cents: The two measures, thanks to refinancing old debt, will raise new money without increasing current property tax rates. But there's a more philosophical campaign happening too. Many of the city's leaders today were children or young adults during Expo '74, the event that created Spokane's iconic Riverfront Park. Now, they're looking toward what they'll leave for the next generation, as the park they saw born four decades ago shows its age. According to the city, the park attracts more than 2 million visitors and 60 events a year, and renovations could attract even more. "There's a yearning to come back and celebrate with our community," says Mayor David Condon. "People want to feel that sense of community, and you only get that through a place where people can congregate in a way that is open to all and really inviting to all." Why does the city want to change the park? It's not just that it's been 40 years since any significant improvements were made to Spokane's central park; it's also that the park was never really designed to be a permanent gathering place. The park was created to serve as the temporary home of Expo, filled with exhibits from countries around the world and then vacated after the fair was over. Today, the park is home to events throughout the year but also serves as an attraction for local families and tourists. That means it demands both green space and up-to-date event facilities. Instead, the event shelters are crumbling and the primary green spaces are also used for events, which degrade the grass year after year. The lighting and buildings are outdated, the bridges need maintenance, the irrigation system is so old that staff can't find replacement parts for it, and the park runs in the red by about $1 million a year. City leaders also see reviving the park as a chance to match the economic development that's happening around the park, like developer Walt Worthy's massive new hotel and the Avista-funded Huntington Park overlooking the falls. If this passes, will the park have more concrete and less green space? The park master plan does propose creating a hardscaped central plaza near the U.S. Pavilion and IMAX theater. This would serve as the location for today's major events and more over the coming years. Yet this and other paved spaces in the park will create only a 2 percent total increase in hardscape over what's currently in the park, according to the Park Board. The IMAX theater would be replaced with a meadow and two existing parking lots would be turned into meadow and playground areas. The renovated park would also feature seven fewer buildings than it currently does and the city would plant a tree inside city limits for every tree removed from the park. Who created the master plan? The Park Board began the master plan process in 2012 and has since solicited public feedback and the help of a citizen advisory committee chaired by Inlander publisher Ted S. McGregor Jr. The advisory committee made its recommendations on changes for the park and the final plan was written and approved by the Park Board this summer. The Riverfront Park Master Plan outlines $100 million of improvements to the park over the next 20 years. The bond, if passed, would fund $60 million of those and the city would look to private, state or federal funds for future projects. The new bond would also pay back $4.3 million in refinanced debt from past park bonds. In total, property owners would pay 34 cents per $1,000 in assessed value toward the park bond. Paired with a streets levy that would cost 57 cents per $1,000, the total rate would be the same as property owners currently pay toward only the old debt. What will that pay for? $24 million: Recovering and relighting the U.S. Pavilion in order to create a central events space that meets current energy efficiency standards (the specific type of covering for the pavilion has not yet been decided). $20 million: Improvements to the park grounds and infrastructure, including a central tree-lined promenade, plazas, playgrounds, river overlooks and Americans with Disabilities Act-compliant access throughout the park. $4.5 million: A new building to house the Looff Carrousel and a visitor center with information about the park and city. The building will include a viewing gallery so visitors can see ongoing restoration work on the carrousel. $2.8 million: Improvements to parking lots and park entrances; new lighting, security cameras and emergency phones. $2.2 million: New outdoor ice rink in the southwest corner of the park, with a concessions, ticket and rental area for both the ice rink and the skyride. $2 million: Two new year-round shelters with exterior terraces and public restrooms. These can be rented to the public for events, helping pay for park operations. $4.5 million: Reserves for cost overruns, inflation or unforeseen expenses. Can I still have input on the park's design? Find the master plan and more renderings at riverfrontparkmasterplan.org.